Why practice with us ? Techniques of Shuriken Jutsu (throwing blades) are often mistaken for a skill that was linked only with schools Ninjutsu 忍術. Not so, these techniques have found their place even in the classical school of martial arts samurais 侍 presented. Let’s look at what is behind this term. Shuriken word is written using these three characters: 手裏剣 and it could be literally translated as “hand hidden blade”. When we look at this in more detail so the word Shu 手 means hand or palm. For an accurate analysis of the words Ri 裏 is needed deeper knowledge of Japanese but simply presents the importance of the idea of ​​”reverse, rear or hidden.” In combination with the first character of the word Shu means “hidden in the hand or palm”. The word Ken 剣 means blade. The last term is the word Jutsu 術, which means “skill or art”. There are two basic types of shuriken – Bo Shuriken 棒手裏剣 and Shaken 車剣 or Hira shuriken 平手裏剣. Bo Shurikens are long and thin blades at the end of forged and polished to a point with varying thickness and shape. Hira shurikens are thin and metal sheets with different numbers of points, usually in the form of “starfish”. School Meifu Shinkage Ryu is focused exclusively only on Bo shurikens. Bo Shurikens are divided into several basic shapes. The first is the long needle like shape, which was also called Hari Gata 針形. The second form follows from the first it is quite similar but is played. Such shuriken is called Kugi Gata 釘形. 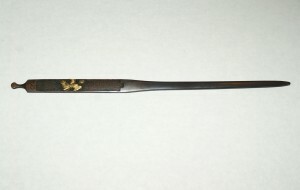 Another type which I will mention here is Tanto Gata 短形. These shurikens were very similar in shape knives. For all of these types to meet many different shapes and sizes. Hira shurikens also be divided into several subgroups. A typical representative of Hira Shuriken is Senban Shuriken 銛盤手裏剣 which was used by Shinobi 忍びin the school Togakure Ryu Ninpo Taijutsu 戸隠流忍法体術. Origin of Senban Shuriken is not known as it is in this area very common but it can be assumed that this could be the pads that are inserted under the nails used to join wood surfaces. 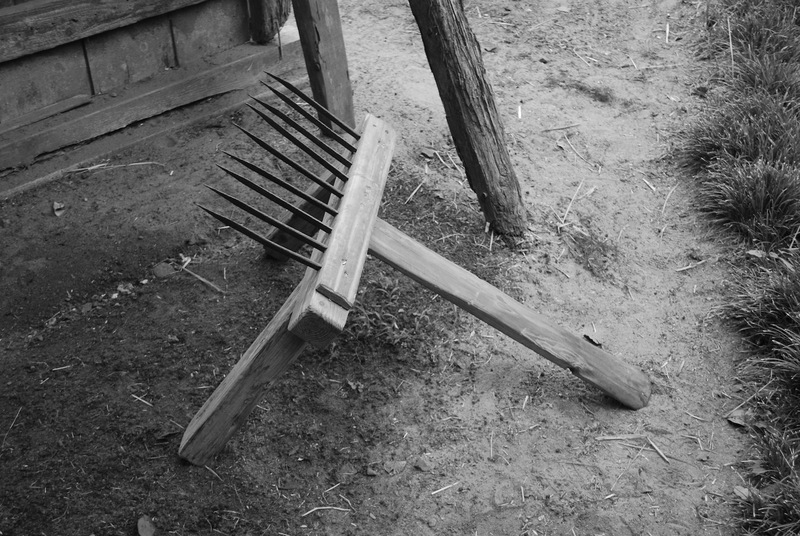 Another theory suggests that it might be a carpenter’s tool used for removing nails from wood. The carpenter’s tools for pulling nails supposedly inspired the Teppan 鉄板, which are larger versions of Senban shurikens and their width can be up to 12 cm. To this group of shurikens are generally classified also Tsubute 礫(つぶて) which were essentially altered rocks and sculptured in a throwing objects. I would like to have said Hishigane 菱金 which were coins that were sometimes sharpened edges. History of Shuriken Jutsu is very long but it is very difficult to trace specific data and information on the origin of the individual schools and traditions. Simply put there are very few historical documents from which we can draw. The techniques themselves were also most secret part of the learning of the schools and as such did not record anywhere so that schools keep their know-how. The only documentation that could exist would probably be in the hands of the school in the forms of Densho (scrolls) whose content would be shown only the most faithful students of the school and after a long period of study. Far more common was that these techniques are passed on in the form of individual schools as Kuden (oral transmission) which is a direct form of teaching from teacher to student. Another reason why there are so many comments about this weapons is that shurikens never been the main weapons of schools but only additional weapons to swords and other weapons. However Shuriken Jutsu consecutively to gain their attention. Chronicle Nihon Shoki 日本書紀 (600 AD) mentions the throwing of stones called Ishihajiki. It is possible that in this case for throwing stones was used sling. Work Kojiki 古事記 which is probably the oldest Japanese Chronicle describes a story in which there is a passage where Prince Yamato casts a chopstick in the eye of white deer, which he thus manages to kill. Another historical work Man’Yōshū 万葉集 of 8 century in one section describes throwing arrows and elsewhere we can find a note on the use of Tsubute – flat stone – for throwing to the enemy. Records of the War Gosennen No Eki 後三年の役 (1083-1087 AD) bearing the name Hiyori No Ki contains a passage that describes throwing short blade hidden in the hand of the warrior – Shuriken Ni Utsu (literally: Attack with a blade in his hand). According to some sources this remark may be the origin of the word of Shuriken. Osaka Gunki 大阪軍記 – the military record of Osaka contains a section that says: “Tadamasa saved himself from the enemy because he drew his Wakizashi and threw it like throwing of Shuriken”. It is argued that Tadamasa later created the first Shuriken called Tanto Gata from blade of the short sword. Chronicles Heike Monogatari 平家物語 a Gikeiki 義経記 mentions practicing Ishi Nage 石投げ or throwing stones. The stones were specially shaped to better throwing and told them Totekibuki 投擲武器 later already mentioned as Tsubute礫 which means „to throw a stone“. Later Tsubute were made from “iron stones” which were called Tetsutsubute 鉄礫 and most likely they were ancestor of Senban shuriken. At present we can see many different kinds of shurikens suggesting that the development of the art of fighting with this weapons was rather fragmented and between schools and areas isolated. According to Otsuka Yasuyuki 大塚保之, Grandmaster of Meifu Shinkage Ryu Shuriken Jutsu 明府真影流手裏剣術 there was no standard or format for the production or use of shurikens, unlike the Japanese sword, which helped to create different shapes of Shuriken schools. Someya Chikatoshi 親俊染谷 tried to create a kind of categorization shurikens in his book “Shuriken Giho 手裏剣技法” but he admitted that no historical records of such categorization is highly speculative and there are many examples that do not fit in his categorization. Many sources describing the development of different types of shurikens are often highly speculative. With certainty we can say that these weapons are often created from instruments in the current period. For example it is claimed that the blades used by schools Chishin Ryu 知新流, Katori Shinto Ryu 香取神道流 and some others were developed from the Japanese nail Wakugi 和釘 which was ideal material for the creation of Bo Shuriken certain shape. In the Meiji period was these studs square and have different strength and length according to the application. When in the course of time usually after the Meiji period their shape changed to round. When we are dealing with the development of these weapons we must mention one fact and that the school including Shuriken Jutsu are very often focused mainly on sword techniques. Some sources claims that some shurikens were forged in same way as the blades of Japanese swords. They were made ​​from very firm and hard steel. But in my opinion it was rather rare. In most cases shurikens made ​​from commonly available materials and their treatment was not nearly as precise. The reason was that most of the throwing shurikens was lost or remained in the opponent or sticked in the ground. Their main purpose was to slow down the opponent’s action or diverted his attention. If they were forged and carefully crafted, it would be the creation of a lot of time and effort and certainly would have just left no discarded after one use. Shurikens, whose shape is more like a needle, as it seems apparently based on objects such as chopsticks or hair pins. The question is whether the blades of this type were created for the purpose of throwing against an opponent or to transform it into a throwing weapon to time. Some sources they maintain that the shurikens initially were used as sidearms than for throwing. In Togakure Ryu also used the Bo Shurikens in combination with Shuko 手虎 which was specific weapon for this school resembling claws. Inserting Bo shuriken for hoop of Shuko on the palm allows the fighter to create far more devastating attacks, strokes and slashes hands. 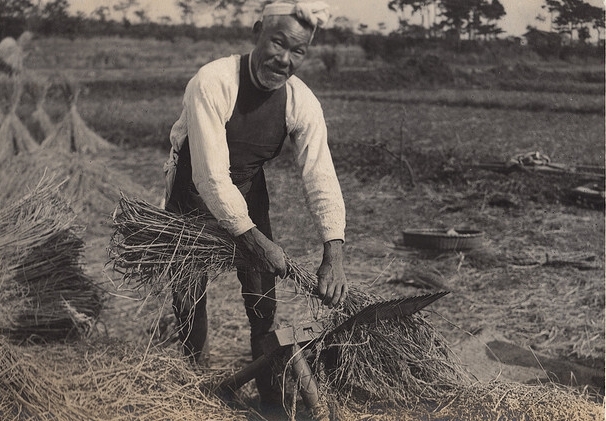 Otsuka Sensei (Soke Meifu Shinkage Ryu) heard about Bo shurikens that were made from parts of tools for agricultural work as for the example Senbakoki 千歯扱き as one of the possible predecessors Bo shurikens. 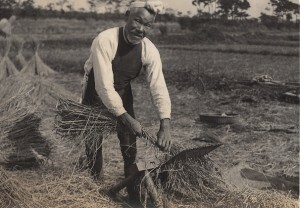 Senbakoki is a tool with a few tips which are “combing” of rice or corn. Reportedly was developed sometime during the Tokugawa period. Other items used as shurikens was for example Kogai 笄, Kozuka 小柄, Hashi 箸, Hibashi 火箸and Hari 針. All of them are long thin objects shaped like knives or needles used for the traditional garments or home clothes and are known for their immediate possibilities as throwing weapons. We could say that they were rather occasional weapons as they were always on hand and gave a good throw. Only later, due to their availability, these objects began to be used as a concealed weapon, but not any traditional school, which is exclusively used them. Kogai is basically long, pointed and metal rod with which I cannot say exactly what purpose it originally served. 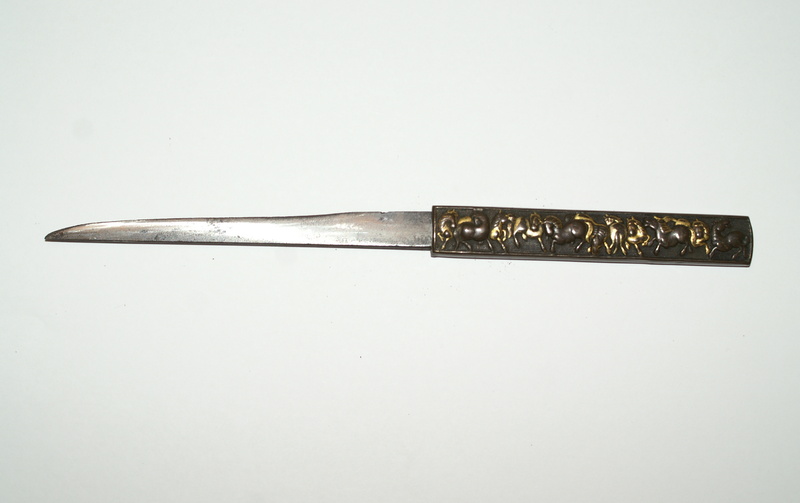 It is known that it was used as a traditional Japanese decorative hairpins. Some sources claims that it was used as scratching of head or cleaner of nails. What is certain is that it was a multi-purpose tool which was also suitable for throwing as a weapon. Kozuka is a small knife that was slided into the side of saya – scabbard of the sword. In this modified Saya was on the other side of scabbard other hole for Kogai and so both of these tools could be part of the set of sword. Hashi are chopsticks which were traditionally made ​​from bamboo or other wood. Some of them were made from metal so they can be subsequently used as a throwing weapon. It is said that the founder of Daito Ryu Aiki Jujutsu大東流合気柔術, Sokaku Takeda惣角武田, was wore their own set of chopsticks that were at one end adapted to tip and ready to change at any time in an effective weapon. Hibashi are metal sticks or tongs for handling of hot charcoal. Otsuka Sensei believes – even if he cannot substantiate evidence – that Hibashi was predecessor of blades were developed by school Shirai Ryu 白 井 流.
Hari are knitting needles, which have been manufactured in many lengths and thicknesses, depending on what purpose they served. Otsuka Sensei believes that a heavy needles designed for sewing leather was ancestor of blades utilized in Negishi Ryu 根 岸 流. That would explain why many blades of Negishi Ryu has at the end rings or holes. It is possible that they then do have threaded to holes or rings some tassels or cords which allowed for easier drawing in the battle or preparing weapons. After the Meiji reforms were suppressed these skills so that´s why it began to slowly die off. This infamous benefit continued after the second World War II. Many similar martial arts were suppressed during the occupation as well as traditional Japanese swordsmithing. However as over the years increased the interest and improve the understanding of Japan began the cultural heritage of this country attract many people from the West so the Japanese culture managed to catch a second wind. Shirai Ryu 白 井 流 would have not long existed but Soke Saito Satoshi again revived the art of this shurikenjutsu school and placed it into practice at school Negishi Ryu. Now students from all over the world visit Japan to be able to learn these arts. Preservation of techniques Shuriken Jutsu to this day was also possible due to the fact that many Koryu Bujutsu 古流武術, traditional old school of martial arts, had these skills included in their teaching. Because of the way how was the arts passed down, from teacher to pupils or from the Grandmaster for his successor, was able to maintain these schools despite the gravest and most difficult times. This applies to schools as Katori Shinto Ryu, Tatsumi Ryu 立身 流, Yagyu Ryu Shingan 柳生心眼流, Kukishin 九 鬼神 流 Ryu, Togakure Ryu, etc. Today it seems that Shuriken Jutsu is increasingly gaining popularity. The information is now more readily available than ever before and so the art of shurikens is taught in many martial arts Dojos that do not have direct historical links to Shuriken Jutsu. For example in Iwama Aikido Dojo 岩間合気道 in Ibaraki Prefecture students have great interest to learn the skills of Shuriken Jutsu so well handled by their teacher Morihito Saito 斉藤守弘. Access to this art has been quite limited until recently, students had to sign an oath of responsibility and still obtain a permit from the Grandmaster himself, which assessed whether art can teach. Later when the metal became more affordable, both in terms of import, thanks to improvements in processing of ore, shurikens were produced purposefully, especially in schools that had a tradition of using them. All Dojo or families had mostly their own blacksmiths, who said about forging blades when needed. Most Sogo Bujutsu, or martial arts that include multiple disciplines have also Shuriken Jutsu techniques, such as Shingan Yagyu Ryu, Katori Shinto Ryu and etc. initially took over all the innovative ideas of individuals in their teaching. Skills began to give form to easier to train, communicate and preserve it for future generations of students. Once the tradition took root forms of transmission in the school and received the sort of basic shape of the blades and thus has every school for itself the typical shape of shurikens, who later began to be typical for the school. There are still many traditional martial arts teachers who continue to teach the treatment of shurikens and continue their development. 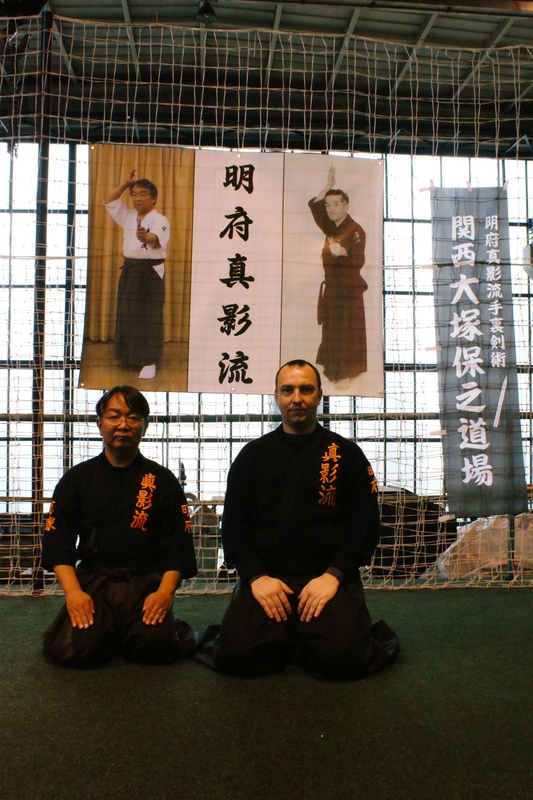 An example of such a person is Soke (Grandmaster) of Meifu Shinkage Ryu, Mr. Otsuka Yasuyuki. Otsuka Sensei took over teaching from his teacher Someya Sensei. Someya Sensei was very skilfull person in Shuriken Jutsu . His knowledges amongst others he wrote in his book Shuriken Giho. His knowledges of old forms of Shuriken Jutsu worked up into the greatest details and some of them adapted to today’s understanding of throwing weapons. Otsuka Sensei studied for several years alongside Someya Sensei and continues in a deep study of these skills and develop their techniques. Otsuka Sensei is also familiar with some very skilled blacksmiths who produces quality blades for technician training in his school.